I know summer’s technically over and this recipes not ‘in season’ for all you fashionable foodies out there, but this is too good to not tell you the recipe! It’s so easy to throw together and super quick (takes 15 minutes – tops! ), perfect for a student like me who’s UP TO HERE in art homework! You guys doing art GCSE – I totally feel ya! It’s taking over my life. And yes, I know its not exactly aesthetically pleasing, but its as sure as hell delicious! 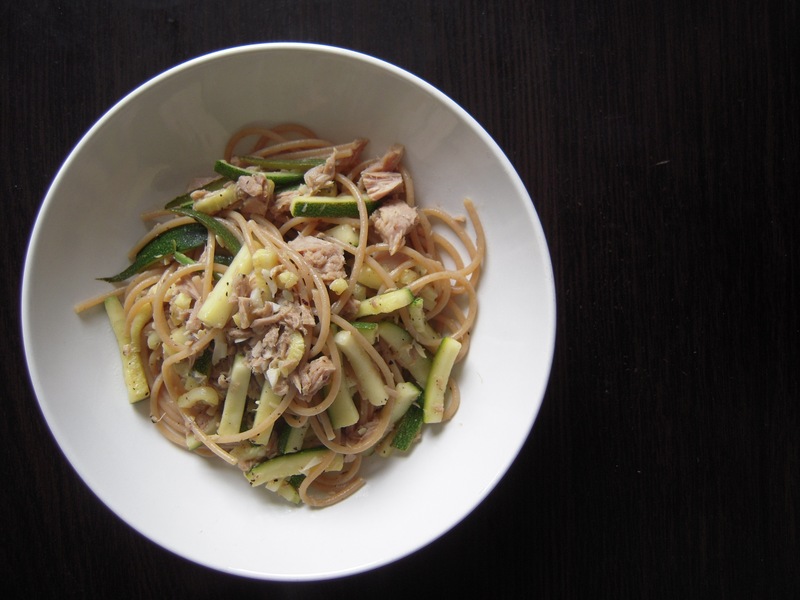 You get zing from the lemon, nuttiness from the whole wheat spaghetti, saltiness from tuna and delicious zucchini that’s cooked perfectly (no soggy zucchini allowed)! Before making the ‘sauce’, boil water and add spaghetti. Cook until al dente (about 2 minutes less that cooking time stated on pac). Julienne zucchini and slice garlic thinly. Heat up some extra virgin olive oil in a pan and add garlic for about 30 seconds then add zucchini. Season with salt and pepper and sauté zucchini for a minute or two. Add lemon and some of the starchy water from pasta until sauce slightly thickens. Add wine. Add can of tuna and slightly break apart. By this time, the pasta should be ready, so directly add it to the ‘sauce’ and stir. Add more salt and olive oil if needed. Just before serving, squeeze a bit more lemon on top.